Nails | My nail care routine. Happy Sunday my gems. 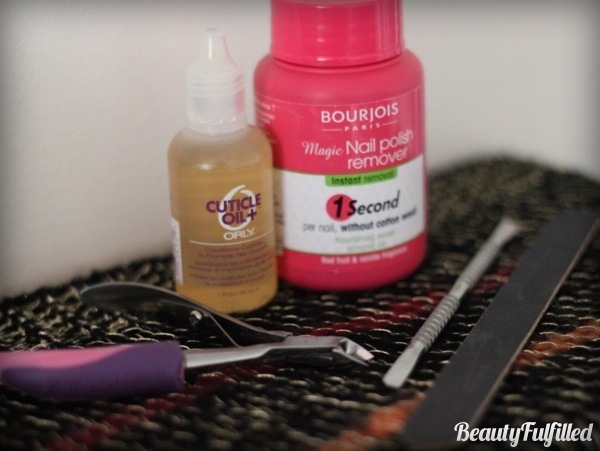 Today one is going to sharing her nail care routine with you all! I have had a few people ask how I get my nails looking the way they do, so here’s a quick run down of the products I use in my current nail care routine. Magic Nail Polish Remover by Bourjois £4.99 available HERE – firstly I gotta make sure my nails are polish free and I use this lovely pot of goodness. Mess free, quick and easy… What more could you want, right? Read more about it HERE. Cuticle Pusher £3.99 available HERE – I love a good clean cuticle! I use my trusty cuticle pusher to do this. Less is more and being gentle is key. You can get lots of different versions of this made from wood or plastic but I prefer the metal version. You can get similar ones from somewhere like Sally’s or Beauty Express. Cuticle Oil Plus by ORLY £13.40 available HERE – last but not least I use my favourite cuticle oil on to keep my nails looking moisturised 🙂 I love this because my skin soaks it up really well and smells absolutely gorgeous – like cola cubes, yummers!